When it comes to the annual Spring flower season in the Cape wishes, it seems, do sometimes come true. Well, guess what? That’s exactly what we got. And it’s still raining as cold front after cold front sweeps in from the South Atlantic, battering the Western seaboard and dropping their precipitation payload over the country’s arid western regions. The upshot has been one of the remarkable Spring flower displays flower enthusiasts have seen in a long time. Talk about feast and famine! 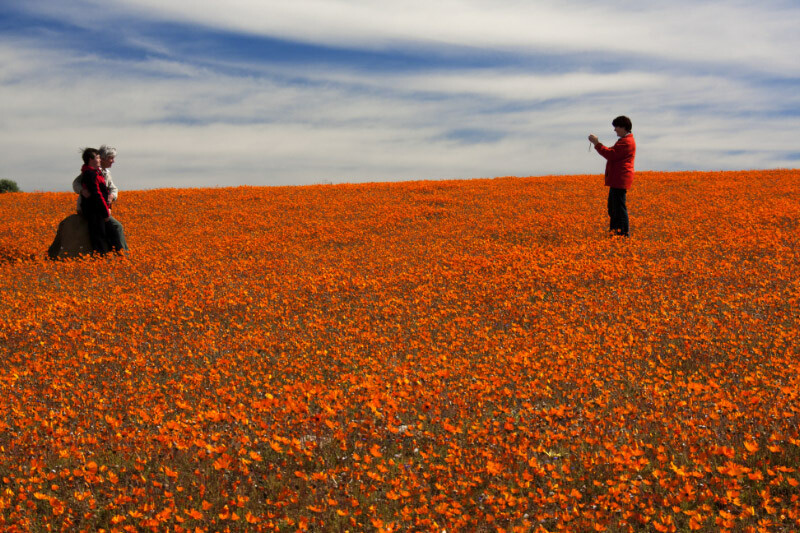 Whereas last year there was hardly a bloom to be found, this year there’s a veritable cornucopia of flowers carpeting the entire countryside from Alexander Bay in the north to Cape Town. Better still, the prolonged rainfall has virtually ensured that this year’s flower season will last longer than most as the delicate blooms replenish themselves from the moisture-laden soil. 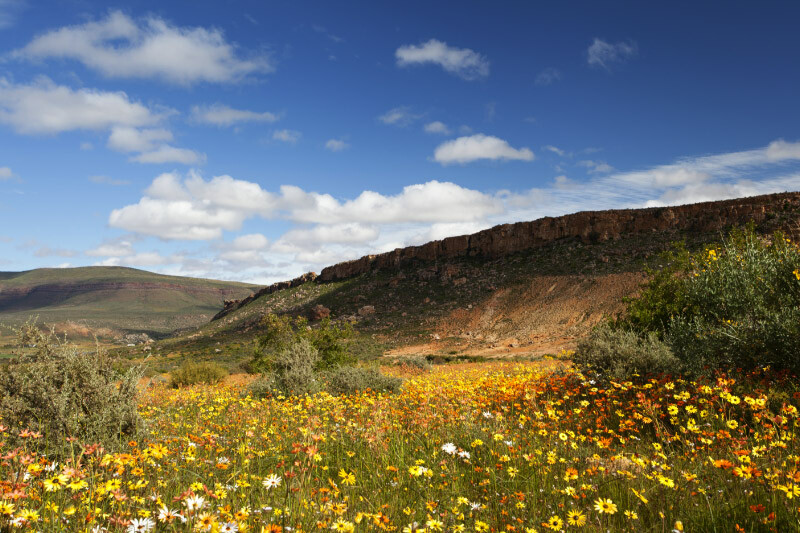 Probably one of the most spectacular flower sightings to be had this year is in the Skilpad Wild Flower Reserve, which forms part of the larger Namaqua National Park. Orange Namaqualand daisies, for which the park is world famous, blanket the ground as far as the eye can see with a burnt orange colour so intense it almost hurts your eyes to look upon it for any length of time. The nearby villages of Kamieskroon, Garies and Leliefontein have also dressed up especially for the occasion. 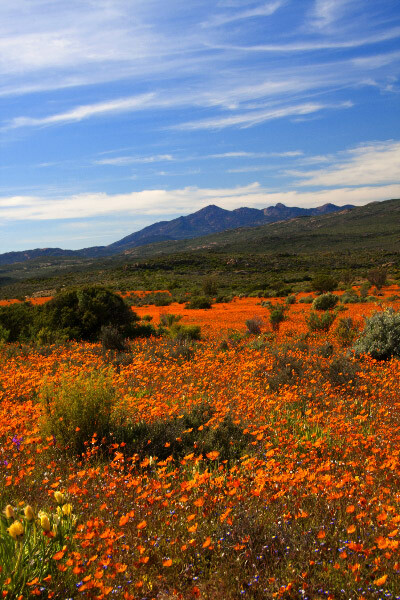 As they try to outdo themselves with the variety and colour range of wild flowers they have on offer, tourists on their way through to the Northern Cape town of Springbok just stop and stare, their mouths agape. Once their initial awe-inspiring first impressions eventually wear off, they invariably rush for their cameras to record the moment for posterity. 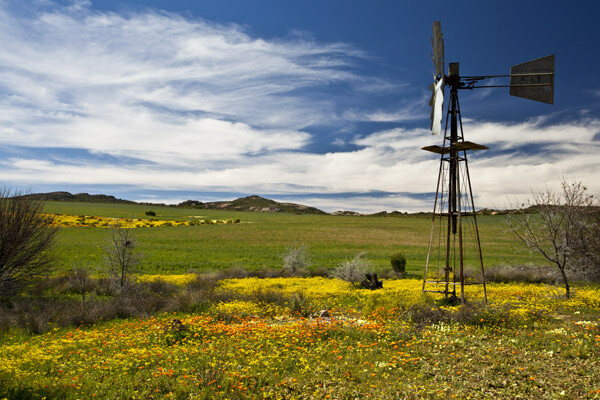 The northerly towns of Nababeep and Okiep are once again boasting delightful shows of orange Namaqualand daisies while the more westerly regions around Soebatsfontein and Sarrisam have vivid patches of orange and yellow daisies which contrast dramatically with the lush green fields they grow in. 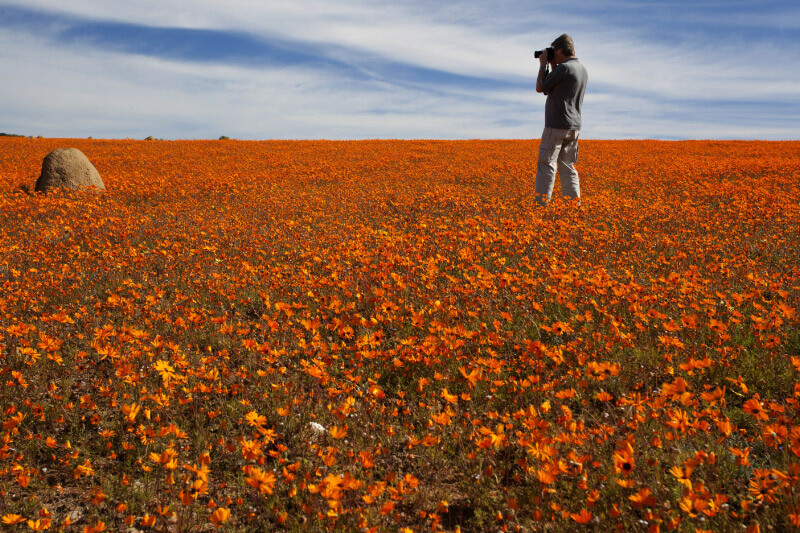 Further south, acknowledged flower expert, Hendrik Van Zijl, of Nieuwoudtville says the town is enjoying a spectacular flower season with the surrounding countryside clothed in a riot of colour of wild flowers of every description, particularly around Papskuilfontein. He says long term farmers in the district have told him that they can’t remember when last the annual Spring flowers looked so good. Meanwhile, not to be outdone, the renowned Biedouw Valley East of Clanwilliam, which habitually puts on a good flower show, has not disappointed either. It probably tops the pops for the sheer variety and profusion of wild flowers it has on offer this year - especially prolific are Namaqualand daisies in various shades of white, pale yellow and deep orange. However, for all the wonderful spectacles to behold, nature, being as whimsical as it is, has occasioned some let downs too. Early on in the season the Flower Report website noted that the flowers in the Goegap National Park were looking particularly good this year. But when we eventually got there the flowers were a big disappointment. An obliging park ranger explained that only the week before an icy cold wind had blown in off the Atlantic for four days solid, shriveling the nascent blooms on their stems. There’s a lesson in this for all us aspirant flower viewers. That is, no matter how splendid the flowers are in any particularly season it never pays to be too complacent. When it comes to things as delicate and fragile as wild flowers, things can change suddenly and dramatically and, apparently, frequently do. It looks like this year’s spring flower season is going the last until at least the end of September. So get there and take in the spectacle while you still can.